Several elements were in my mind as I worked on this piece. I wanted to include: future, diversity, innovation, evolution, vision, imagination and creativity. These elements are the fundamentals of humanity and culture which help shape mankind’s destiny. This exhibition is now the second collaboration between Ron Robinson and me. It has been a really good experience, and I’m looking forward to working with him on similar projects in the future. You can read more of Ron's work here. Hopefully, that would be an art that idealistically expresses the spirit of the Dakotas - an art that represents everyone. Below is a beautiful poem Ron Robinson wrote as part of our collaboration to express the idea in both words and painting. where mountains bear the likeness of our faces. into stone, as though in this to conquer time? stir in fear of wolves that howl the stars. downward, and whose greed will drive us crazy. before we face the greater, final spiral? But what can atone, what reverse the spiral? as mere attractions, have sold their own brief time. up the steps of time, let flourish men and bison. Though now it may seem crazy, we meet next in the stars. 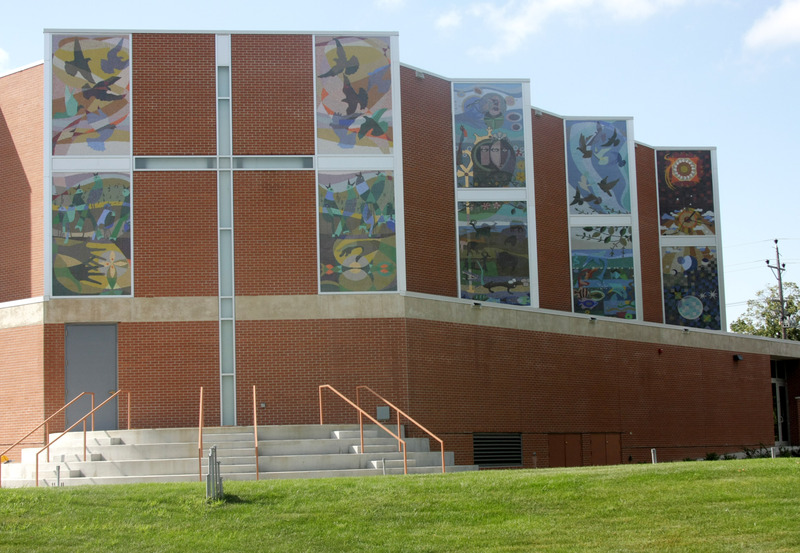 Eight mosaic panels, glass and ceramic tile, 23 ft high and 7 ft wide each. Art helps to expand our minds’ capacity and lifts up our spirits. Art is a joy. 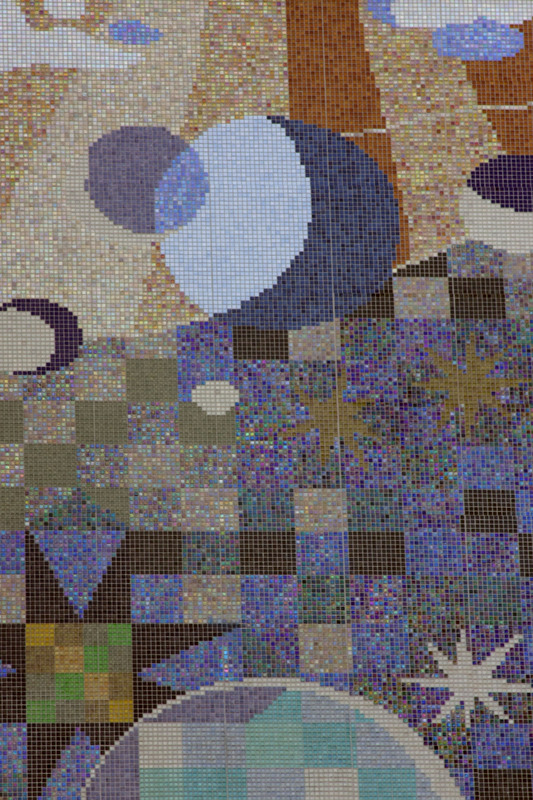 Someone might be going through the day thinking about his or her daily activities, and suddenly he or she stops in front of a mural that depicts the beginning of the world. It breaks us out of time, it gives us a moment for ourselves that lifts us out of the stream of daily busyness. I was reading in the book Art Forms a few days ago, and came upon this passage: “A technologically explosive society needs the humanizing rewards of artistic experience. 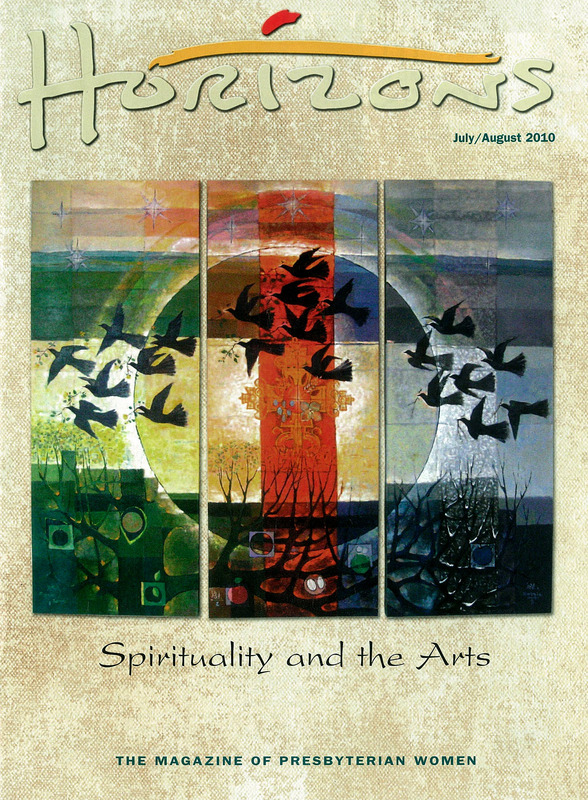 The arts help meet our emotional and spiritual needs… Art helps us to see. How we see determines how we live.”When we read books, we are given a window into knowledge that we didn’t have. Works of art provide another means of learning, another window into knowledge. Children can look and learn without words. Art conveys a spiritual knowledge without depending on words. The Seven Days of Creation is a different mural from most that I have seen. Many artists will simply submit an idea for a mural and from there, other people produce the mural itself. In this case, from the initial sketches, to the detailed drawings, to the finished paintings that were the design for the mural, I went through every step to make sure that the original concept was carried through to the final mural on the wall. I hand-selected the colors for each section of the mural,and worked carefully with the ones who were building the mural throughout the process. A note about the technical aspect of creating a mural like this: There are three different ways to construct a mural: the Direct Method, the Indirect Method, and the Double Indirect Method. 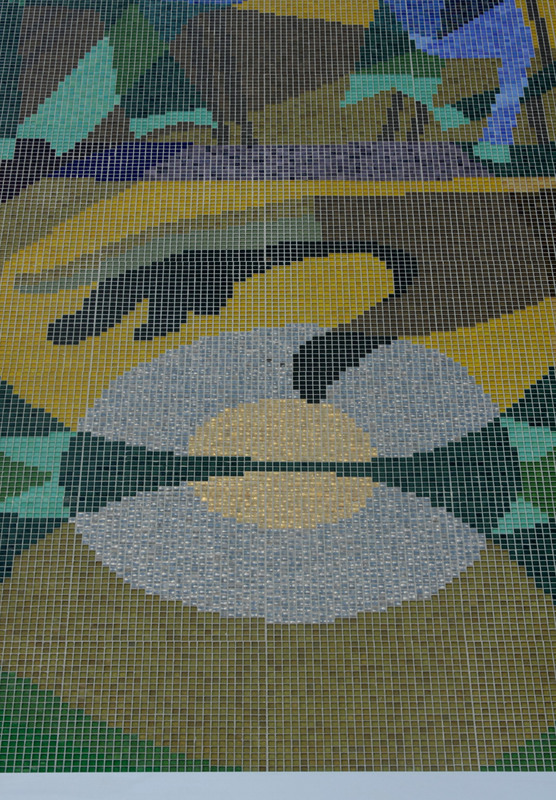 In the first, tiles are placed directly on the final surface. In the second, tiles are placed in a mirror image of the final design on an intermediate surface, and then transferred to the final surface. The third method, which is the one used on the Seven Days of Creation, requires those building the mosaic to first construct the finished design on one surface, then transfer it in reverse to an intermediate surface, and then to transfer it to its final surface. All of us are born for something. I think part of my purpose is to help people around me to create art on a higher level. 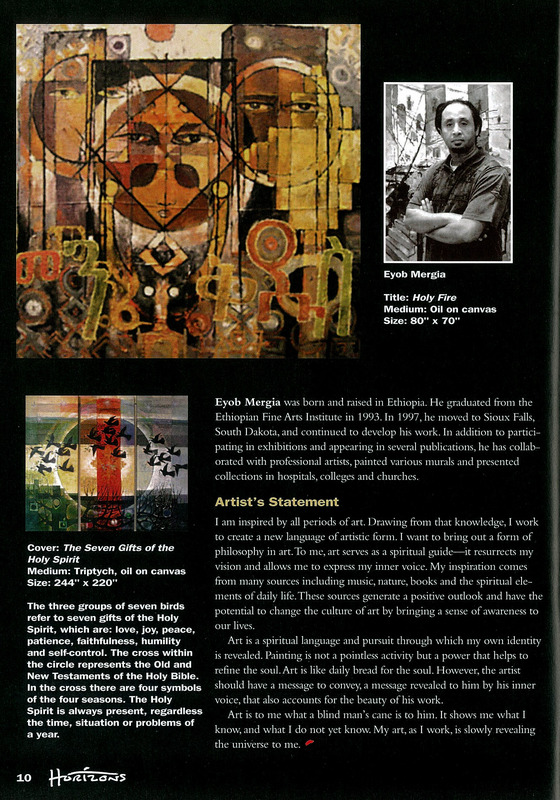 An artist creates an artwork to communicate to his audience, and also to educate and influence younger artists. Michelangelo’s Sistine Chapel and Picasso’s Guernica are both examples of an artist communicating his ideas, and also attempting to change the culture around them. One of my goals in my art in general, and in the Seven Days of Creation in particular, is to create a higher standard for art and culture, to raise the level of art that is produced in Sioux Falls and in the world around us. As I promised, here is a garden for the four seasons, a gift to the world like it has been given to me. This is a legacy that will go on for generation to generation. Special thanks to Syverson Tile for their patience and support, to Sicis for the wonderful collaboration, and to Our Savior’s Lutheran Church for both the opportunity to be part of this project and for their sponsorship. 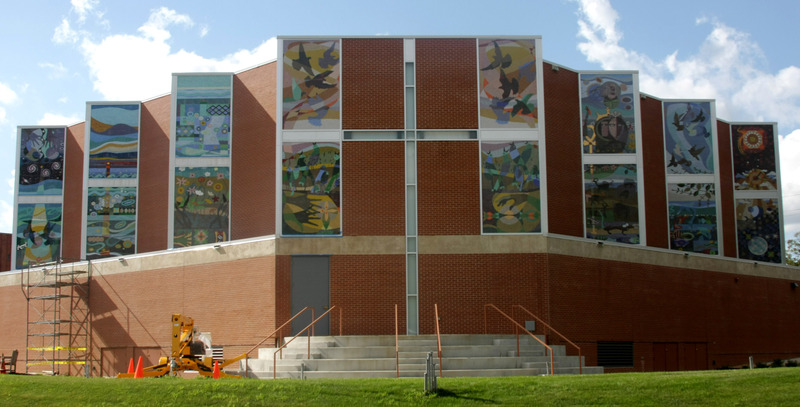 An article in the Argus leader about the mosaic's design. To see more details of the original design, visit my website. This is a painting that I did years ago for Avera McKennan about the Seasons, and the Seven Gifts of the Holy Spirit. (To read more about the painting itself and where it's displayed, take a look at the Avera McKennan website.) The purpose of this triptych artwork was to bring a healing spirit and hope to patients in their facility. I woke up in Ethiopia in the middle of the night, after many hours of traveling the day before. I hadn’t yet adjusted to the time difference, and I was wide awake. My eyes were staring out at the darkness of my room and there were sounds all around me. My mind and body were still in a fog from the travel, and it took a few moments to make sense of the sounds that woke me. There was a confusion of singing from the nearby church, and dogs barking, and the howl of hyenas, and the calling from the mosque, and there in the distance, the sound of a second Christian church, all layered and overlapping each other. This blend of sounds came to me as one indistinct whole, one complex sound. The beauty of the moment—with the sounds coming from the distance, the darkness, the danger of the distant hyenas’ howl and the safety and comfort of the familiar and nearby human sounds—the moment was so beautiful that I sat up and started sketching, trying to capture the sounds, the moments, the image of myself and the harmony of those nights sounds washing over me. Also, I was struck by the strangeness of the nocturnal hyenas’ call in what my body thought was the middle of the afternoon. One of the challenges, and the joys of being an artist come in moments like that. How to capture that moment, that flash of experience, and to present it to your audience and to yourself? You can’t take a photograph of that experience—it wouldn’t show it all. Neither would an audio recording of those sounds, nor a video. None of those mechanical methods of recording the sight and sound of that experience can capture a sense of the person who was experiencing it. The idea, the experience comes, and the artist trains himself or herself to be able to let that idea flow through him and onto his paper as he sketches, and sketches and sketches. It’s as if I am a falling leaf, carrying in the cup of my leaf the sounds of those churches and the feel of the night air. I’m in the process of developing these ideas into a series of paintings, and I’m looking forward to presenting them in the coming months. After traveling through Ethiopia and Germany and Vienna, Austria this summer, it’s good to be back home and back in the studio. I’m going to be participating in an open house in a few weeks at the Artisan House Galleries, on August 12th, from 5-8pm. I’ll send out more information as the time gets near, but mark your calendars and come on out. A few weeks ago I had the opportunity to lead a workshop for students at Augustana College. The concept for the workshop came from one of my previous pieces, The Guitar Strings. Two previous pieces, The Guitar Strings and the Wisdom of Axum, were both good preparation for this workshop as I worked to gain an understanding of the materials involved, the colors and the relationship between the pieces. Some materials have similar colors, and we can use these materials as one large brushstroke. We applied the materials as one would apply oil paint or watercolor to a painting. I believe this kind of exploration gives each person, each artist, the opportunity to take the work in his or her own direction. Once one has started an oil painting, for example, it’s very difficult to use watercolor on the same canvas, because oil base doesn't allow the water to stick. So we need to use another medium to put watercolor on top of the oil paint. The question is how to use properly media that are not traditionally used side by side. One goal of this workshop was to give the students some experience outside of the traditional, single media format. In this project, the students used a variety of very different materials to create one unified composition. "Composition," according to Wikipedia, "is the placement or arrangement of visual elements or ingredients in a work of art, as distinct from the subject of a work." 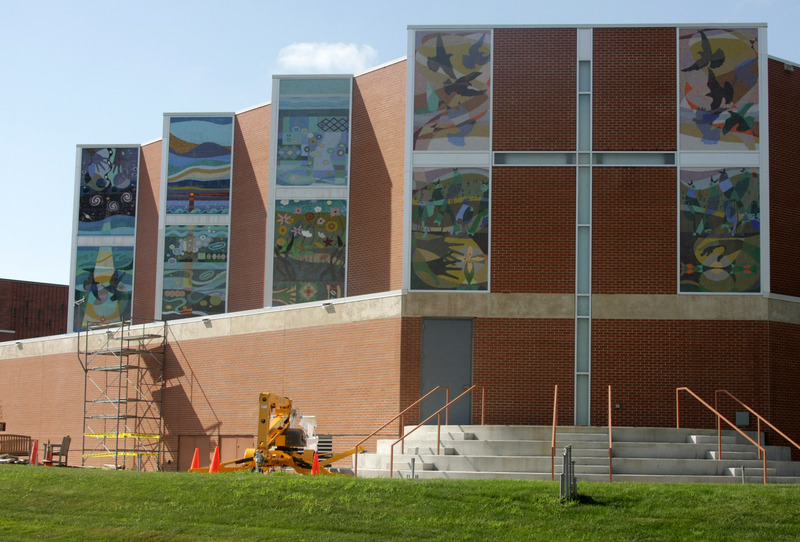 The work created is reminiscent of Alberto Burri's art. (See image left.) Antoni Tápies used similar techniques in his work. (See right.) Both of these artists applied many years of experience and knowledge to the work in front of them. I'm always inspired by seeing their work, and their skill. Given the short amount of time that we had to work, the students worked well and created some really nice pieces. I’m glad to have an opportunity to participate in the curriculum in this way. It’s very beneficial for the students to have a variety of experiences like this, and to be exposed to a variety of professional artists and teachers. For the benefit of the artistic community, and the community in general, we want students to graduate with rich, wide experiences. I would love to see students coming out of local art programs prepared to exhibit their work at a professional level, and ready for professional work in the arts. The works will be on display from February 12th until March 11th. This show includes a collection of works done in the period from 2002 to 2010, based on conceptual elements of Axum. Axum was a city, the capital of a kingdom and the center of a civilization. From four hundred years before Christ until nearly six hundred years after the fall of Rome, the area that is now Ethiopia was ruled from the city of Axum, the capital and crown of the Kingdom of Axum. At the height of its power, Axum was a force to be reckoned with both on land and at sea and was one of the four kingdoms of the world. Both Roman and Byzantine accounts attest to Axum’s influence in trade and commerce. The legendary Queen of Sheba reigned in the region eight or nine centuries earlier; her historic journey to King Solomon’s court in 980 BC, with 700 camels loaded with gold, ivory and other gifts, is well documented in the Old Testament. Her bathing pool and substantial remains of her palace can still be found in Axum. The Axum civilization was one of the first to adopt Christianity (in the early 4th century), but the obelisks pre-date the Christian period. Perceived as the cradle of Ethiopian civilization and once the gateway between Africa and Asia, Axum was a thriving trading centre when Jesus was preaching in Palestine. Ships from Egypt, India and other countries in the orient stopped off there to load up with gold, ivory, incense, spices, hides as well as live animals such as elephants and monkeys. Part of its success in commerce was due to its unique location—on the Red Sea between the African continent and the Arabian Peninsula; it was well-positioned to take advantage of trade routes. At this crossroads between cultures and continents it drew elements from its South Arabian as well as North African neighbors. The Axumite civilization developed its own form of writing, called Ge’ez, which is still used to write several languages, including Amharic and Tigrinya, two of the languages spoken in modern-day Ethiopia. Another lasting and significant contribution of the Axumite period is its distinctive architecture, echoes of which can still be seen today. One of the enduring architectural remnants of the Axumite period are the stone monuments known alternately as obelisks or stelae. They are thought to have been erected to mark burial sites, as monuments to the dead, but they have come to be the symbols of the Axumite civilization. These obelisks vary a great deal in size and are found throughout the region, but the largest and most well-known stele, the Obelisk of Axum, is nearly eighty feet tall. In 1937, in the aftermath of Fascist Italy’s brief conquest of Ethiopia, one of the stelae now known as the Obelisk of Axum was carried in pieces to Rome by Mussolini in 1937, as spoils of war. For decades it was a source of contention between the two countries—various Ethiopian leaders called for its return, and various Italian leaders cited technical difficulties and high costs of transport as obstacles. Finally in April 2005 the Obelisk was returned, again in pieces, to the city of Axum - 68 years after it was looted by Italian fascists. On Friday, February 12th from 7 to 9pm there will be a reception at Augustana's Eide/Dalrymple Gallery to open up my solo show, Axum. The show will be open for a month--February 11th to March 12th. I've been working on the pieces in this show, and the concept behind it, for several years now, and I'm looking forward to it. Come join us and enjoy the exhibition.